Maryanne was born in Melbourne in 1960. While she was very young her family moved to Ballarat, Victoria, where she was educated. She retains strong links to this regional city. Maryanne was born in Melbourne in 1960. She attended the Victorian College of the Arts in Melbourne from 1979 to 1981 and graduated with a Bachelor of Arts (Fine Arts) Painting. She undertook further studies at the University of NSW graduating in 1984 with a Graduate Diploma in Professional Studies (Painting). She commenced a Master of Arts candidature in 1996 at the University of Ballarat converting this to a PhD candidature in 1997, receiving her Doctor of Philosophy in 2000. 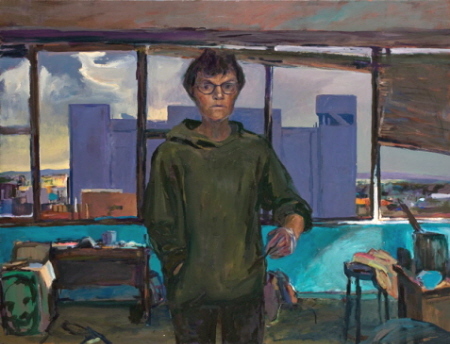 Her PhD thesis is entitled, "Using Narrative Strategies in Contemporary Figurative Painting". Maryanne has exhibited in both solo and group exhibitions in regional Victoria, Melbourne and elsewhere in Australia. She is regularly invited for inclusion in curated exhibitions and her work has been shown as a finalist in several Dobell Drawing exhibitions, the Portia Geach Memorial Award, the Moet Chandon Touring Exhibition, the Blake Prize and the Doug Moran Portrait Prize. The work presents a profoundly satisfying integration of interior and exterior space and light which links the subjective space of artist's studio to the world outside, and by implication,to the psychological space we occupy as viewers. Maryanne has worked as a Sessional Lecturer at the Arts Academy, University of Ballarat (1999 - 2003), the Department of Fine Art and Design, Monash University, Melbourne (2000 - 2005) and the Faculty of Humanities and Social Science, Latrobe University, Bendigo Campus (2008). She was a Lecturer in the Faculty of Arts and Science, Australian Catholic University, Melbourne and Ballarat campuses (2003 - 2004). She is currently (from 2006) a Lecturer in Drawing and Painting in the Department of Fine Art, Monash University, Melbourne. Artist's statement Working with a definition of narrative as an intersection between space, time and narrative voice, Maryanne Coutts' research investigates the nature of narrative in relation to painting. This analytic approach shifts between work which focuses on narration through self reflexive strategies and work which investigates ways of conveying time through the spatial vehicle of painting. Through an engagement with the processes of animation, she has become increasingly fascinated by the further potential to investigate a narrative space, through a time based medium. This biography written by Margaret Rich, August 2009. 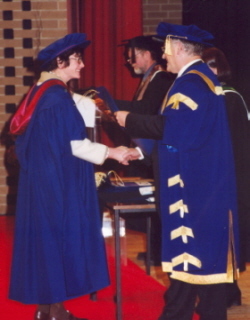 Image caption (left) - Maryanne Coutts receives her Doctor of Philosophy at the University of Ballarat, 2000.